Introduction: Psychiatric comorbidity among opioid injectors is the co-occurrence of other mental disorders among them besides being dependent on injecting opioid. Objectives: The purpose of this study is to find out the prevalence of psychiatric comorbidities among opioid injectors and to find out the association between drug use Profile with psychiatric comorbidities. Materials and Methods: All the consecutive opioid injectors who attended Drug De-addiction Centre, tertiary care teaching hospital, Imphal, from October 2013 till September 2015 were interviewed with General Health Questionnaire-12 to assess the mental health status, they were interviewed with Mini-International Neuropsychiatric Interview plus for the diagnosis of mental conditions. The data were analyzed statistically using Statistical Package for Social Sciences (SPSS21) software. Results: One hundred and five opioid injectors were enrolled in this study. 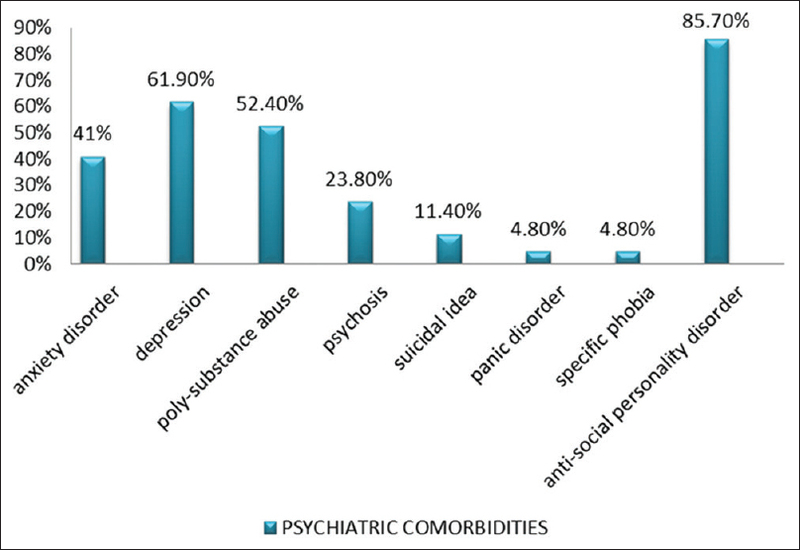 The common psychiatric comorbidities were anti-social personality disorder 85.7% (n = 90) followed by depression 61.9% (n = 65), poly substance dependence 52.4% (n = 55), anxiety disorder 41% (n = 43), psychosis 23.8% (n = 25), suicide 11.4% (n = 12), panic disorder 4.8% (n = 5), and specific phobia 4.8% (n = 5). Conclusion: This study shows that the majority of dependent opioid injectors are vulnerable to many psychiatric comorbidities which should be screened and treated side by side while treating the dependency. In this present world, where the number of opioid injectors are increasing, we realize that the number of opioid injectors are increasing in Manipur too, these people develop a number of psychiatric comorbidities, this has attract the researches among health professionals especially those in the field of mental health.,,,, Research on psychiatric comorbidities specific to opioid injectors has not been conducted in Manipur lately so we thought its important to conduct this study so that better information are being collected regarding the psychiatric comorbidities among opioid injectors in Manipur so that findings can be compared with that of the other geographical area. Psychiatric comorbidity in the context of substance use disorders usually refers to the co-occurrence of psychoactive substance use and other mental disorders. Approximately 2% of the population of Manipur inject drugs. Our objectives in this study are (1) To study the prevalence of psychiatric comorbidities among opioid injectors. (2) To study the relationship between substance use profile and psychiatric comorbidities among opioid injectors. We present data mainly from the De-addiction center of tertiary care teaching hospital Imphal both Outpatient Department (OPD) and In Patient Department. Heroin is the injected opioid in this study population. A cross-sectional study was conducted at the Drug De-addiction Centre of tertiary care teaching hospital, Imphal from October 2013 till September 2015. All consecutive cases of injecting drug users (IDUs), who attended OPD of De-addiction Centre and who fulfilled our Inclusion criteria were included. Inclusion criteria are as follows: (1) Age 18 years and above. (2) individuals with opioid dependence as per criteria of the International Classification of Disease, Tenth Edition (ICD-10), (3) Those willing to give valid consent and agreed to participate. (4) Any gender. (5) History of using opioids by injecting route at least once in the last 3 months which means current IDUs as defined by National Acquired Immune Deficiency Syndrome Control Organization. Exclusion criteria:Patients who could not be engaged in a meaningful interview on account of their communication difficulties. Working definition laid down for this study was psychiatric comorbidity among opioid injectors is the occurrence of other mental disorders among them besides injecting opioid (morphine, codeine, heroin, oxycodone, hydrocodone, dextropropoxyphene, fentanyl, and methadone). The study tools include: (1) psychiatric interview + ICD-10, (2) a semi-structured pro forma for the assessment of patterns of substance use, (3) General Health Questionnaire-12, (4) Mini-International Neuropsychiatric Interview-Plus for the diagnosis of the mental condition. The reports were collected, and the results were analyzed statistically using SPSS 21 software (IBM Corp, Armonk, Newyork, US). Significance was tested using Chi-square. P < 0.05 was considered as statistically significant in my study. Ethical approval to carry out the study was sought and permitted from the Institutional Ethics Committee tertiary care teaching hospital, Imphal in 2013. A total of 105 patients came, study shows that majority of the client were from the age group of 31–40 years (40%) the least among 51–60 years (2.9%), people belonging to both type of family were equivalently involved in opioid dependence through injections route. More opioid injectors were among the client who had studied up to 10–12 standards (n = 58) but are not students currently, followed by the graduates (n = 36). The least were among the postgraduated clients. Of 105 patients, majority were married (n = 63), i.e., 60%, unmarried = 39% (n = 41), one patient was separated from his wife due to drug use. About 33.3% (n = 35) were self-employed and constitute the highest number among the opioid injectors, followed by the full employed patients, i.e., 31.4% (n = 33), the least was among the part-time employed patients, i.e., 5.7% (n = 6). 32.4% does not reveal their income, 28.6% has their income more than Rs. 10,000, 1.9% has their income less than Rs. 4500. In this study, there were 105 opioid injectors, out of 105 the prevalence of psychiatric comorbidities were anti-social personality disorder 85.7% (n = 90) being the most common in this study, depression 61.9% (n = 65), polysubstance abuse 52.4% (n = 55), anxiety disorder 41% (n = 43), psychosis 23.8% (n = 25), suicidal idea 11.4% (n = 12), panic disorder 4.8% (n = 5), and specific phobia 4.8% (n = 5) [Figure 1]. Test results show that 47.6% (n = 50) of the opioid injectors inject opioid only. 52.4% (n = 55) abuse other substance as well besides being dependent on opioid. The most commonly abused substance with opioid is cannabis followed by alcohol though heroin is their primary drug. Out of 105 opioid injectors 43 has anxiety disorder, out of 50 pure opioid injectors 17 has anxiety disorder, out of 55 polysubstance abuse 26 has anxiety disorder. This study is found to be significant. Multinomial logistic regression was also carried out to understand the depth of association of polysubstance use (with two categories) of the respondents with the Psychiatric comorbidities under study. Among the two categories, the polysubstance abusers had some significant predictors. Anxiety is being expressed by many respondents with an odds of 1.0 as compared to 0.235 not showing such symptoms [Table 1]. Brooner et al. in his study had a sample size of 272 in our study we have 105. Armstrong et al. reported in their study at Delhi the prevalence of depression and anxiety disorder among the IDUs to be 84% and 71%, respectively. However, in this study, the prevalence of depression and anxiety is lower and found to be 61.9% and 41% respectively. Delhi being more urban than Manipur with a busy lifestyle may be the reason Armstrong et al. got higher results of depression and anxiety. The use of different scale and different sample size may have yield different results. Grant also demonstrated the association between depression and intravenous drug users. 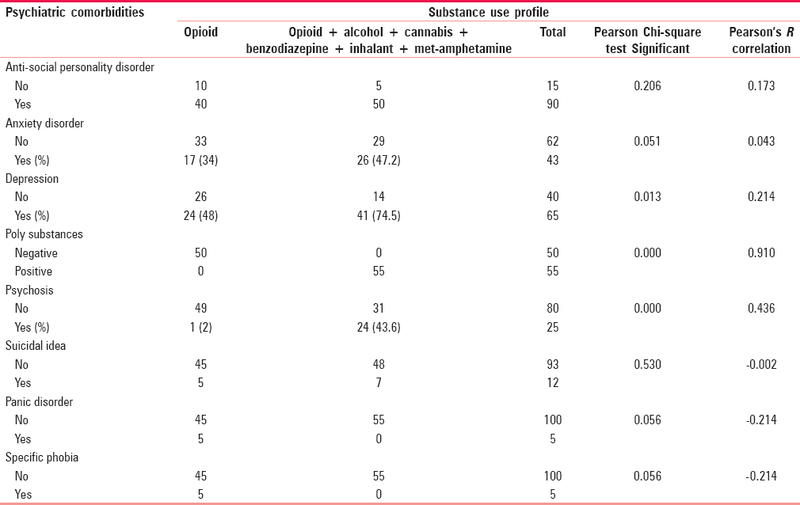 In this study, polysubstance dependence was 52.4%, the other common substance abused besides injecting heroin is cannabis followed by alcohol, followed by benzodiazepine followed by methamphetamine and inhalant. This study is consistent with the study of Fischer et al. and Mackesy-Amiti et al. In this study, the prevalence of psychosis was 23.8% most probably due to comorbid use of cannabis and alcohol. Some patients are already schizophrenic and comorbidly abused heroin in injection form, as reported by Mueser et al. and Regier et al. In this study, the prevalence of suicidal idea was 11.4%, suicidal idea among opioid injectors had also been reported by Armstrong et al. as 36% in their study. Delhi being more urban with busy lifestyle where people have less time to communicate with others may be the reason that Armstrong et al. got higher prevalence of suicidal idea, different sample size can also contribute to difference in the results. In this study, the prevalence of panic disorder was 4.8% and specific phobia was 4.8%. These findings are consistent with the report of Ahmad B et al. The comparison between pure opioid injectors and opioid injectors with polysubstance abuse: 47.6% (n = 50) of the opioid injectors in this study injected only opioid and did not abuse other substance. 52.4% (n = 55) abuse other substance as well, the other common substance abused besides injecting heroin is cannabis by smoking and bhang form, followed by alcohol taken orally, followed by benzodiazepine taken orally, followed by methamphetamine taken orally or smoking depending on the mood followed by inhalant like dendrite by inhaling. The opioid injectors use heroin as the primary drug and abuse other drugs on and off basis. This study is consistent with the study of Fischer et al. and Mackesy-Amiti et al. Results shows some significant findings: The prevalence of anxiety disorder, depression, and psychosis are more among opioid injectors with polysubstance abuse than among pure opioid injectors, the reason for anxiety and depression most probably due to cumulative effects of the other substance abused such as alcohol, benzodiazepine, and methamphetamine which are notorious of causing anxiety after withdrawal from heavy use. 2% of the pure opioid injectors in this study already had psychosis not otherwise specified and inject opioid, 43.6% among the opioid injectors with polysubstance abuse develop psychosis secondary to polysubstance abuse possibly induced by cannabis and or alcohol but there is every possibility that the individual already had dormant illness which appear after he abuse the polysubstances. The highest psychiatric comorbidity among opioid injectors was anti-social personality disorder. Depression, anxiety disorder, polysubstance abuse, and psychosis were also high. Suicidal idea, specific phobia and panic disorder were also present. There is a significant correlation between opioid injection with anxiety, depression, and polysubstance dependence. However, psychosis is more associated with the polysubstance abusers where alcohol and cannabis are suspected to be the main culprit. (1) Screening result has given us an awareness regarding the presence of other comorbid psychiatric illness and help us to give other required care to the opioid injectors at the earliest. (1) Purposive sampling from a de-addiction center leading to inability to generalize the findings to adolescents, community samples, and geriatric population. (2) Female sample could not be collected since no female opioid injectors came to seek treatment during the study so the findings cannot be generalize. Armstrong G, Nuken A, Samson L, Singh S, Jorm AF, Kermode M, et al. Quality of life, depression, anxiety and suicidal ideation among men who inject drugs in Delhi, India. BMC Psychiatry 2013;13:151. Aharonovich E, Nguyen HT, Nunes EV. Anger and depressive states among treatment-seeking drug abusers: Testing the psychopharmacological specificity hypothesis. Am J Addict 2001;10:327-34. Miele GM, Trautman KD, Hasin DS. Assessing comorbid mental and substance-use disorders: a guide for Clinical Practice. J Pract Psychol Behav Health 1999;5:272-82. Mackesy-Amiti ME, Donenberg GR, Ouellet LJ. Prevalence of psychiatric disorders among young injection drug users. Drug Alcohol Depend 2012;124:70-8. Regier DA, Farmer ME, Rae DS, Locke BZ, Keith SJ, Judd LL, et al. Comorbidity of mental disorders with alcohol and other drug abuse. Results from the epidemiologic catchment area (ECA) study. JAMA 1990;264:2511-8. Bhushan K, Gangadhar BN. Acute effects of alcohol, opioid and cannabis use. In: Lal R, Rao R, Mohan I, editors. Substance use Disorder Manual for Physician. 2nd ed. New Delhi: NDDTC AIIMS; 2013. p. 26-38. Chandrasekaran P, Dallabetta G, Loo V, Rao S, Gayle H, Alexander A, et al. Containing HIV/AIDS in India: The unfinished agenda. Lancet Infect Dis 2006;6:508-21. Brooner RK, Greenfield L, Schmidt CW, Bigelow GE. Antisocial personality disorder and HIV infection among intravenous drug abusers. Am J Psychiatry 1993;150:53-8. Grant BF. Comorbidity between DSM-IV drug use disorders and major depression: Results of a national survey of adults. J Subst Abuse 1995;7:481-97. Fischer B, Rehm J, Brissette S, Brochu S, Bruneau J, El-Guebaly N, et al. Illicit opioid use in Canada: Comparing social, health, and drug use characteristics of untreated users in five cities (OPICAN study). J Urban Health 2005;82:250-66. Mueser KT, Bennett M, Kushner MG. Epidemiology of substance abuse among persons with chronic mental disorders. In: Lehman AF, Dixon L, editors. Double Jeopardy: Chronic Mental Illness and Substance Abuse. New York: Harwood Academic; 1995. p. 9-25. Ahmad B, Mufti KA, Farooq S. Psychiatric comorbidity in substance abuse (opioids). J Pak Med Assoc 2001;51:183-6.